Australia's Emirates One&Only Wolgan Valley is located northwest of Sydney in New South Wales. From Sydney, driving time is about three hours, or 45-minutes by helicopter. The resort property sits at the foot of the Donkey and Wolgan mountains, part of the Greater Blue Mountains World Heritage Area. 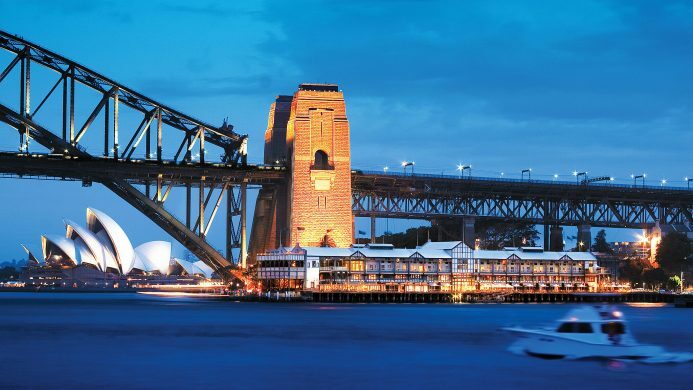 Enjoy Australian luxury in the rugged heart of the Blue Mountains. 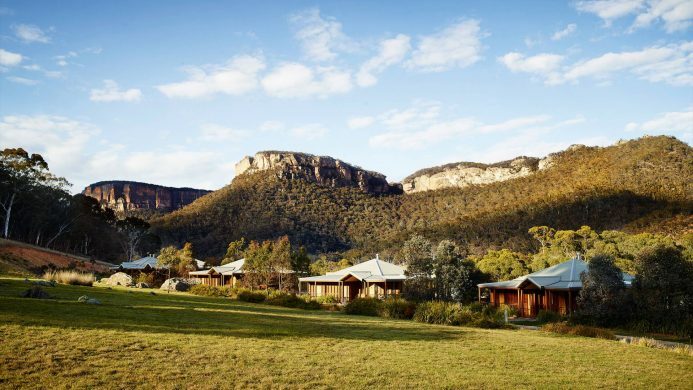 Emirates One&Only Wolgan Valley offers a wilderness escape only a few hours from Sydney. Nestled in a breathtaking valley, Emirates One&Only Wolgan Valley delivers luxury hotel accommodation in the midst of pristine wilderness. Through every window of this intimate, 40-suite resort, you'll discover natural vistas that'll have you reaching for your in-room binoculars. That blue-green glow isn't your imagination - it's light refracting through tiny particles of eucalyptus oil hanging in the air. 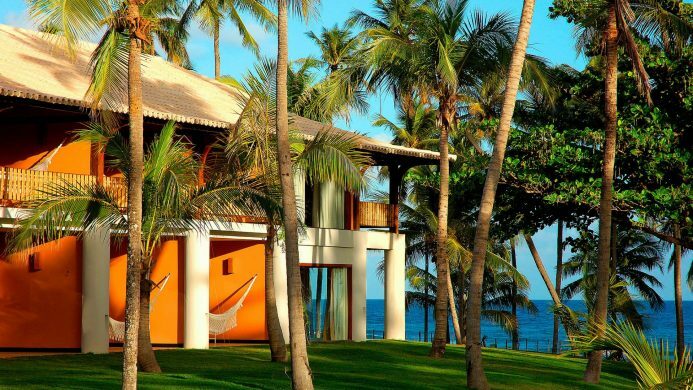 The resort is committed to environmental sustainability and conservation. Its design blends effortlessly with the surroundings, yet nothing is sacrificed in comfort or convenience. Each private suite features the latest in entertainment technology, along with private pools, decks, and fireplaces. Beyond your doorstep, explore Wolgan Valley and surrounding countryside on horseback, by bike, or on foot. Private guides are available to tour historical and natural points of interest. The possibilities are limited only by your imagination and energy. Send an availability request with your requested dates to the Emirates One&Only Wolgan Valley. Constructed from wood and stone typifying the Federation period, the 36 free-standing Heritage Villas are ideal for single guests or couples looking for a relaxing retreat or romantic getaway. Each offers exceptional privacy and breathtaking Wolgan Valley views, as well as a private pool with its own deck and concertina doors, making it perfect for year-round use. Inside, a central, double-sided fireplace made of local sandstone separates the bedroom from the living area. Warm, earthy tones and neutral linens are complemented by wood furniture crafted by local artisans, offering a unique sense of style and place. A luxurious bathroom features twin vanities, separate shower with skylight and bath with views to the valley. Heritage Villas offer an entertainment system and Wi-Fi Internet access, whilst thoughtful extras such as binoculars allow for up-close-and-personal viewing of Wolgan Valley wildlife without having to leave the comfort of the villa. 2 people maximum. Fees apply for any extra guests. 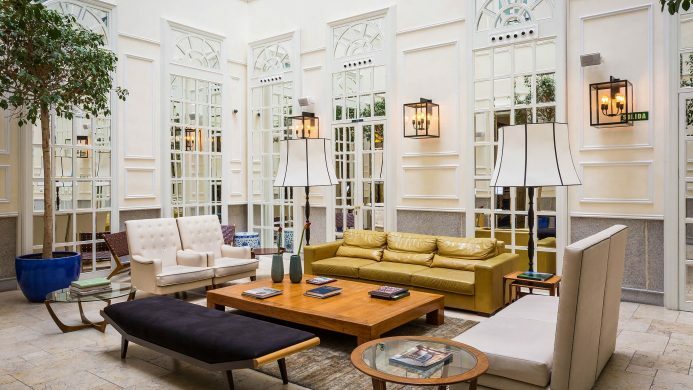 Constructed from wood and stone typifying the Federation period, the 36 free-standing Heritage Villas are ideal for single guests or couples looking for a relaxing retreat or romantic getaway. Each offers exceptional privacy and breathtaking Wolgan Valley views, as well as a private pool with its own deck and concertina doors, making it perfect for year-round use. Inside, a central, double-sided fireplace made of local sandstone separates the bedroom from the living area. Warm, earthy tones and neutral linens are complemented by wood furniture crafted by local artisans, offering a unique sense of style and place. A luxurious bathroom features twin vanities, separate shower with skylight and bath with views to the valley. Heritage Villas offer an entertainment system and WiFi access, whilst thoughtful extras such as binoculars allow for up-close-and-personal viewing of Wolgan Valley wildlife without having to leave the comfort of the villa. Constructed from wood and stone typifying the Federation period, the 36 free-standing Heritage Villas are ideal for single guests or couples looking for a relaxing retreat or romantic getaway. Each offers exceptional privacy and breathtaking Wolgan Valley views, as well as a private pool with its own deck and concertina doors, making it perfect for year-round use. Inside, a central, double-sided fireplace made of local sandstone separates the bedroom from the living area. Warm, earthy tones and neutral linens are complemented by wood furniture crafted by local artisans, offering a unique sense of style and place. A luxurious bathroom features twin vanities, separate shower with skylight and bath with views to the valley. This Heritage Villa offers 2 Twin beds, an entertainment system and Wi-Fi Internet access, whilst thoughtful extras such as binoculars allow for up-close-and-personal viewing of Wolgan Valley wildlife without having to leave the comfort of the villa. An ideal family retreat or the perfect hideaway, each of the Two-Bedroom Wollemi Villas features a large living room with separate lounge and dining areas, double-sided fireplace, two spacious bedrooms and a private, temperature-controlled swimming pool. With extensive views of the Greater Blue Mountains, each villa takes full advantage of the expansive backdrop of imposing escarpments. The villas have been thoughtfully designed to provide space to gather with family and friends, or indulge in a peaceful retreat to relax with a good book. The main bedroom features a King-size bed whilst the second bedroom can accommodate either a King bed or two King singles. Whether planning a romantic night in, enjoying a family meal, watching a film from the resort's extensive collection, relaxing on the veranda or enjoying a dip in the pool, Wollemi Villas are the perfect accommodation choice to make the most of this stunning Greater Blue Mountains setting. 4 people maximum. Fees apply for extra people.